Bulk timer pillboxes -pill box timers, custom imprinted with your logo. 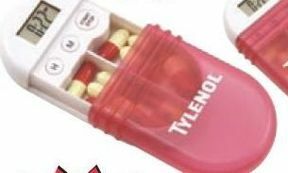 If you're on a strict medication schedule, this pill case will help. Fill the two compartment cases with your pills and set the countdown timer to notify you of your next medication. A red LED lights up when the alarm goes off. A neck cord is included for convenience and portability. Case comes in white with translucent red sliding cover that displays your imprint. Operates on two button cell batteries (L1154) included. Gift boxed. We also supply wholesale bulk blank (not imprinted) timer pillboxes for $5.99 each (minimum 50) . American clients pay no taxes, Canadian clients don't pay PST. We will send you a proof for your approval before production. Prices include your custom 1 color, 1 side imprint. Set up charge is $40.00 per color. Extra imprint colors are $0.40 per color, plus an additional $50.00 Setup Charge. Blank (not imprinted) timer pillboxes cost $5.99 each (minimum 50). Extra Imprint Colors: add $0.40 per color, per pill box timer.